Go Greeley continued his winning form with a hard-fought score in Sunday’s $150,000 Vandal Stakes, at Woodbine. Owned and trained by John Ross, the dark bay son of Horse Greeley arrived at the Vandal off a convincing 2 1/2-length score in the open Colin Stakes. Go Greeley, piloted by Eurico Rosa da Silva, dueled for the early lead with Arlington Park shipper Heart to Heart, ridden by Emma-Jayne Wilson, through splits of :22.53 and :45.65 in the six furlong ‘Poly’ stake for two-year-olds. Matador, a first time starter, was urged into contention from fourth-position through the turn by Luis Contreras, but the front-runners kicked away at the top of the lane and battled the length of the stretch with Go Greeley prevailing by a nose over Heart to Heart. Man o’ Bear rallied for show money. Go Greeley covered six furlongs in 1:10.33. Da Silva appreciated the grit and determination of his foe in the race to the finish. A pace duel was not the plan leaving the gate for da Silva. Go Greeley won at first asking in a 4 ½-furlong maiden allowance event on May 19. The colt’s training was then interrupted in June as the horse was in quarantine due to a minor outbreak of equine herpesvirus on the backstretch. On his return to racing action, Go Greeley rallied to be second, defeated just a nose, after a troubled trip in the Clarendon Stakes, on July 7. The talented colt redeemed that loss with his front-running Colin score. Ross continues to be impressed by the imposing dark bay. Go Greeley banked $90,000 in victory, while improving his record to 3-1-0 from four career starts. 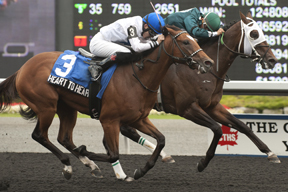 He returned $4.20, $2.80 and $2.60, pairing with Heart to Heart ($5.10, $4.40) for a $19.20 (2-3) exactor. A 2-3-5 (Man o’ Bear, $8.80 to show) triactor was worth $232.70. Matador completed a $1 Superfecta (2-3-5-1) worth $406.25. Grom and Iron Wolf were scratched.